On grounds of former DC Jail. Fun, challenging and intense, with dual tees and baskets (Red and White). Red to Red is a decent "pitch and putt", while White to White will challenge even the best. On over 53 acres - expect to walk ~3 miles playing 18. Tee signs show lengths and identify tees. Red tape on baskets points to next tee. Beware ticks, spiders, chiggers and other wildlife. From 7 to 8, walk 0.5 mile on dirt bike trail - back again from 16 to 17 on same trail. I-95 to exit 163 West on Lorton Rd. (Rt. 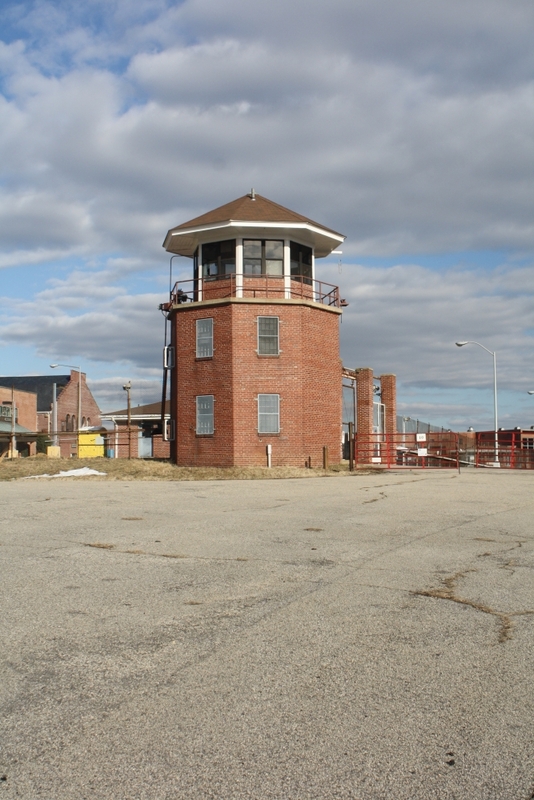 642), Right on Silverbrook Rd., Left on Power House Rd., Left on Reformatory Way, Parking lot beyond guard tower. 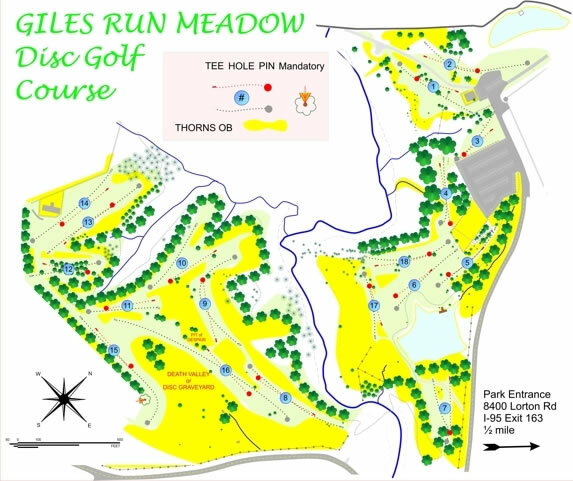 Amazing course, beautiful, nature, elevation changes, rolling hills, fair ways, rough, etc. It has what you want in disc golf. With the 2 tees and 2 baskets on every hole, this course has 72 possible holes to play. fun elevation changes and a punishing rough. shank a disc and you have a 50% recovery chance. 1. course progression is not logical. you really have to look for the next tee. playing first time alone without a map may not be possible. they do a good job marking the course, but I would have liked 1 or 2 signs on the 1/4 mile trail across the creek between holes. 2. course layout has a high walk to play ratio. its like the course owner had 7 "must have" holes, and filled in the other holes around them. look at holes 4-7 for example. you end up getting through a round instead of playing through it. Those things said, if you ware willing to walk for it, this course is incredible. it has all the elements of a pro course with shorter tee/baskets for novice players. be ready to send spotters ahead for many holes. if you don't see exactly where you go into the rough, you are unlikely to recover your disc after hole 8. The above review says about everything that needs to be said - spacious, beautiful, challenging. A nice way to kill a coupla hours. I hail from North Carolina, where many courses send you through tight and dense wilderness and trees jump in front of you to take a bite out of your discs; playing a course with mostly open fairways was a nice change of pace! I really want to love this course, so I will reiterate a coupla points for the first time player. 1) This course is confusing. Tees do not progress logically. 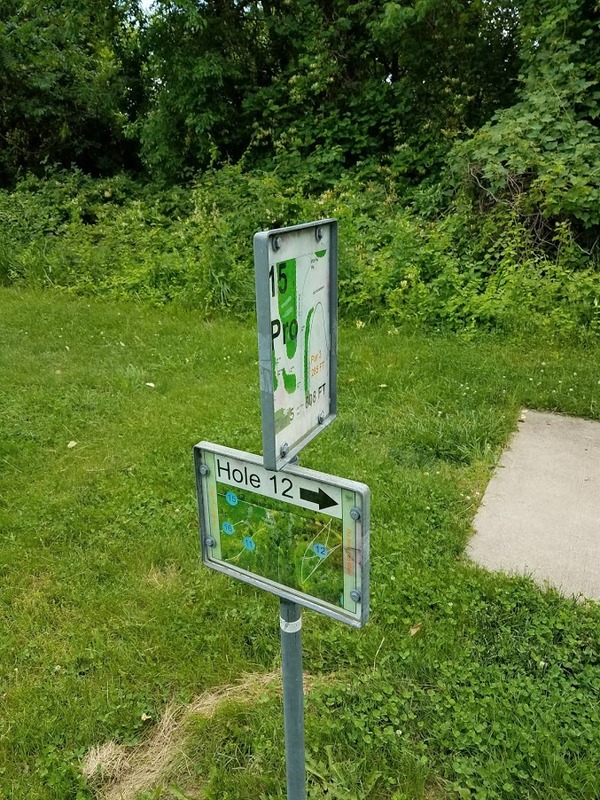 Signs may or may not exist to point you in the direction of the next hole. There is a course map by the road as you come in. PAY CLOSE ATTENTION. TAKE PICTURES. If not for my buddy's camera phone, we'd have missed most of the course. Still got royally fooled by the 6-7-8 run. Probably best played with someone who's been there a few times. Otherwise, good luck. 2) Most thorns I've ever seen on a course. If you throw out of bounds, you will be wading through thick nettles and thorns, coming out looking like a war veteran. Painful and frustrating! For your own sake, wear jeans and closed-toed shoes. 3) The underbrush ensures you will lose a disc or two. We lost two, but found two more! It took three hours for two of us to play this course first time around. THREE FULL HOURS. (I finished around even par or +1, so it's not as if we were babies out there.) We were beaten down, bloodied, bruised, and completely worn out. When I win the lottery, I am going to install small wooden signs near each basket pointing in the direction of the next tee. An awesome, awesome course. This is my regular course; I've probably played it at 20 times. It is never, ever crowded. The holes are long and wind through rolling hills, creeks, meadows, and tons of thorns. This can be a punishing course, with lots of walking and lost disks. And it's gotten tougher over the last year with missing signs. But this is a beautiful course and is challenging enough to keep me coming back indefinitely. -Play red-to-red the first few rounds. Get used to the thorns, so you'll be trained to avoid them. I've probably lost 5-10 disks here, but found almost the same amount. -Yes there are ticks. But I soak my legs with Deep Woods Off before every round, and I've been fine wearing shorts. -But be warned: I've come home with red, scratched up, chewed-up legs before. If you have to go hunting in the rough, there are all sorts of weeds and thistles that will give you a nasty looking rash for a day or two. Like I said - punishing. -Getting from hole 6 to 7 to 8 is pretty tricky. Do your research or flag down someone that knows the course. Or be prepared to walk. -Whatever you do; play to the white basket on hole 15. -Ticks, thorns, thistles, and big (non-poisonous) snakes. Not for the faint of heart. -A black hole for discs. Definitely best course in NOVA...if you're willing to walk 3 miles, get 2-3 ticks and swim in thorn bushes. Dont bring unexperienced players here because they WILL lose their discs. I was in a party yesterday that lost 4 discs (but we found 4 new ones while looking for the others). Definitely pay attention to next tee hole before you tee off if you've never been here before, you WILL get lost. 1st hole is on the farthest right side of the parking lot past the lonely gate. 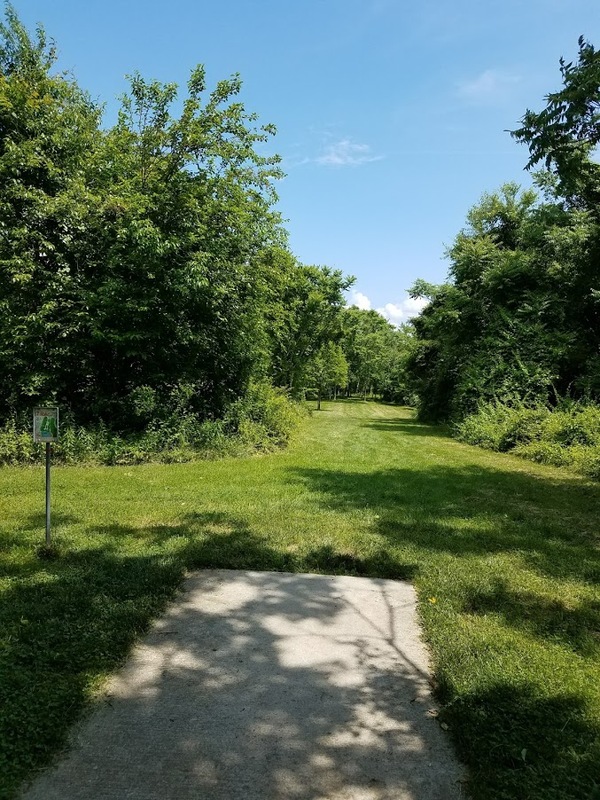 The finest disc golf venue in Northern Virginia, and perhaps in the DC area. 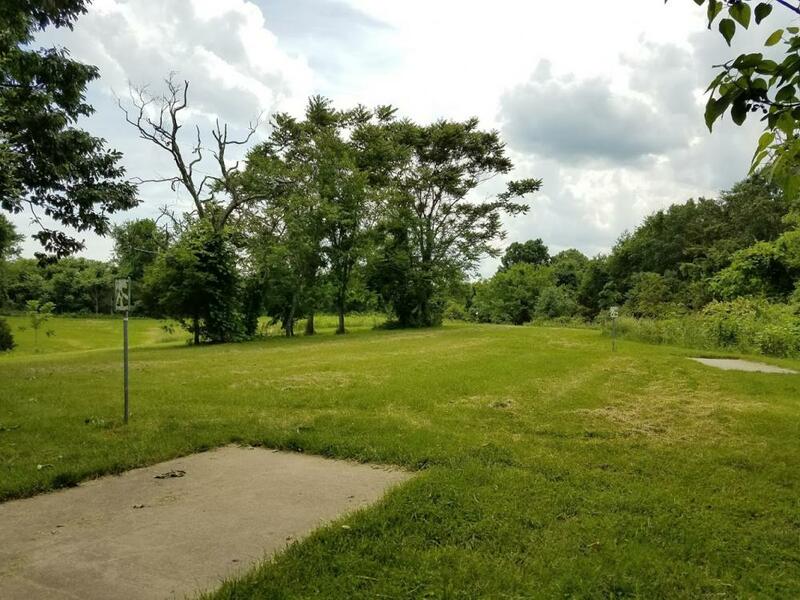 Located on 53 acres of unspoiled land the first 7 holes play in the shadows of the old Lorton Reformatory, while Holes 8-16 are played in a wide open rolling landscape with spectacular views and lots of wildlife to enjoy. Each hole features a pair of tees and baskets, with formats ranging from relatively easy (Red to Red) to World Class (White to White). Signature hole is "Murderers Road", hole 16, which White to White is 915 feet.